Gentles who spent time at the Pennsic AE Royal encampment had the opportunity to take a swing at striking medieval coins. A temporary mint was set up at the side of the Royal Presence tent, where two different coins were struck. One coin was the Royal coin for the treasury of King Sven and Queen Siobhan. It was carved in the manner of a 10th-century Anglo-Norse coin. One face was designed and crafted by Master Anias Fenne and the other by Lord Guillaume le Noir. The other coin was a memorial coin in remembrance of Prince Titus, carved in the manner of the memorial coin of Constantine the Great (4th century) by Prima Argentia. Gentles who struck Titus’s coin took their handiwork with them so that they could be reminded of our friend in times to come. The carved dies were then sent to Prince Titus’s home kingdom of the West, where similar mints will be set up at coming events. 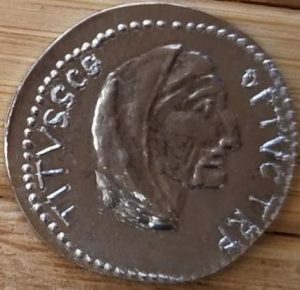 The Pennsic mint was set up during the Debatable Lands’ Baronial reception, during Prince Titus’s memorial reception, and during the Kingdom Party. Hundreds of children and adults lined up to see how hard they needed to swing a hammer to get a complete imprint onto a coin, and also to learn about the artwork and inscriptions on Roman and Viking coins. Pictures of the struck coins (along with their historical documentation) can be found at the Moneyers Guild website. 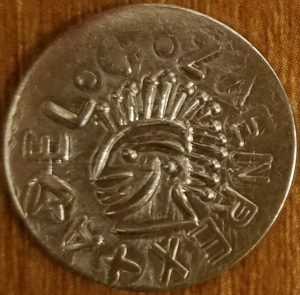 Or, if the Royalty are particularly impressed with your service, They may reward you with one of these coins from Their own hand. 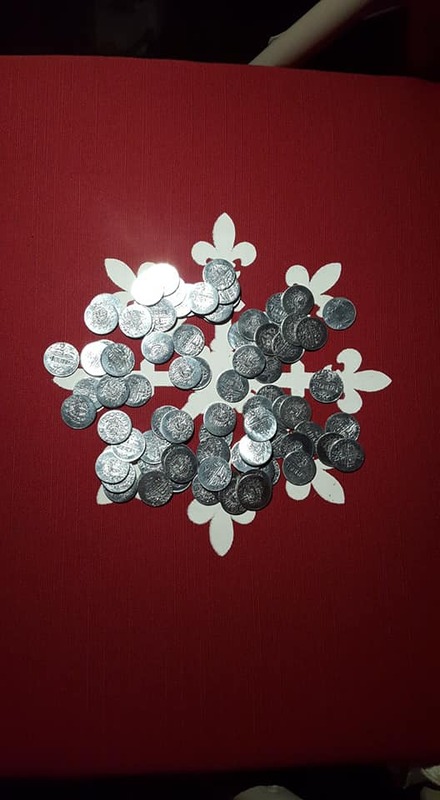 Thanks to the strong arms of the populace of AEthelmearc, the kingdom treasury is again filled with coin. Photographs courtesy of Prima Argentia and Earl Byron.